Bright! Bold! Light! Satisfying! 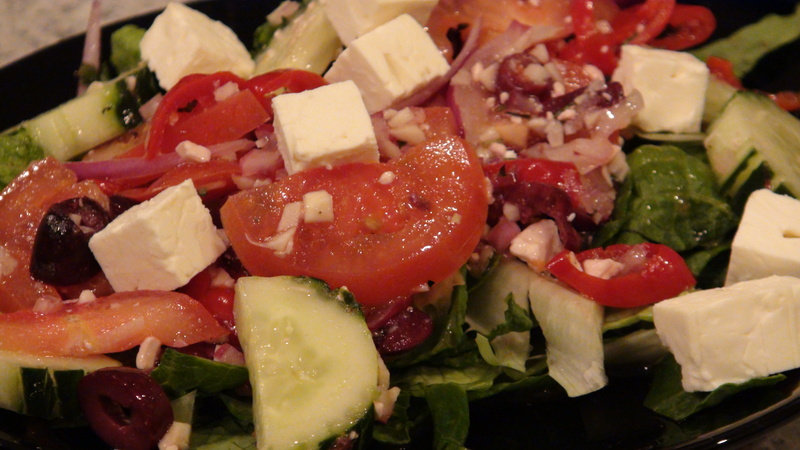 When I think of Greek food, those are the attributes that come to mind. While designing this menu, I attempted to capture my favorite flavors of Greek family-style restaurants. Creamy and salty feta cheese, smoky kalamata olives, loads of garlic, sweet and spicy pickled peppers, fresh oregano, fresh lemon, tender skewered meat, and a boat-load of vegatables…are you hungry yet? We used to eat out a lot! Greek family restaurants were often our favorite places because of the yummy Greek food and the amazing variety they all seem to offer on the cheap. Among our favorites were anything with Lamb, and of course a Greek salad. Each house has its own style of dressing, but they all share the theme of being very bright and having an addictive quality. 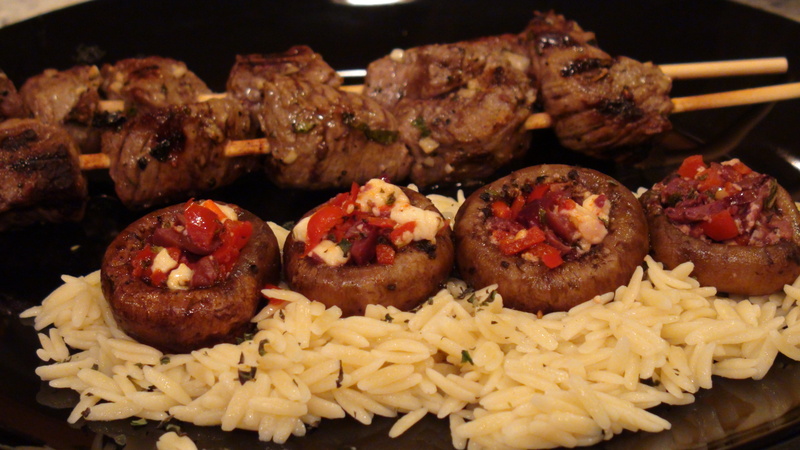 Kebabs are also featured, and they are a no-fail kind of recipe that beginner-level cooks and ninja chefs alike will appreciate. While we demonstrate with Lamb (because we love it) ANY kind of meat can be used. We tested the recipe with lamb shoulder, dark and light meat chicken, and leg of lamb steak. All of them were tender and delicious. The marinade is so effective. I’m convinced that you could tenderize rubber balls with it! (Please don’t actually do that, lol!) Seriously, you can’t mess these kebabs up! I bet you could turn this into a vegetarian entree by subbing big chunks of uncooked butternut squash for the meat. Cook them at a little lower temperature so that they don’t burn. About the stuffed mushrooms…they are filled with delightfully pungent ingredients and cooked via a seared-then-steamed technique that is also very hard to mess up. Planning appetizers for the super-bowl? Consider making a big batch of these as hors ‘d oeuvres and watch the crowd chow them down. It’s a good way to make sure your friends and family are eating their veggies!